Every now and again I like to tackle a crafty project, to give my creative side a splurge. This week I've been making a dolls house for Lily out of a cardboard box I brought some groceries home in. I got inspired by one of Lily's birthday presents, which was a Little People doll and two dogs. I thought it would be fun for Lily to have a dolls house for these new toys, and fun for me to build one. As it turns out, Lily has been integral to the process, helping me choose wall paper and gluing it on. She also chose fabric for the doll's bed and couch, and helped me paint the second story floors. It's not quite finished - I'm just doing a bit here and there as I get time - but I thought some of my more crafty readers might like to see what I've made. Step 1: Using an exacto knife, cut a large flap in the front that opens downwards. Step 2: Turn the box over and cut the end flaps on a diagonal to form the angle of the roof. Cut one side first, and use the triangle that is cut off the edge of that flap as a stencil to make the other three cuts at the same angle. Step 3: Using an acrylic paint, paint the inside of the top flaps white, as these will form the ceiling. Step 4: Paint the outside walls the colour of your choice. I chose light blue, which I made by mixing white acrylic paint with a splash of cool blue. Step 6: Wall paper the inside walls with scrap-book paper. (Lily and I stuck it down with glue stick.) We also glued florally scrapbook paper to the opened-out flap to make a garden. Step 8: Using cardboard from another box, cut strips of cardboard that slot in on the left and right-hand sides of the box and form the second floor rooms. Lily and I painted these strips white and then I secured them with pearl-headed sewing pins. Step 9: Cut windows with shutters by drawing a box on the wall, cutting horizontally along the top and bottom lines of the box, and then cutting vertically down the centre of the box. Pop the flaps open and you've made shutters. Step 10: Sew the back flap of the dolls house roof to the two side flaps. We left the front flap free so it can be folded down for extra access into the dolls house. Step 11: Cut an arch in the roof at the front above the flap, to provide more visibility into the dolls house and make it easier to access the top story rooms. So that's what I've done so far. We're still decking it out with furniture that I'm making out of re-purposed rubbish. So far I've made a couch and a bed, by sewing covers onto small cardboard boxes. I also sewed two cushions for the couch and a duvet for the bed (the pillow is still to come). This is a fun project for me, although the house is a bit of a mess right now with scraps of fabric and cardboard lying around the place. I don't know why that bothers me so much. Sometimes I wish I could just relax into mess, because at least it shows we're living and creating. Anyway, here's another look at the dolls house for you. As you can see, Lily has already taken to it with a felt-tip marker. Oh well, at least it's only cardboard. 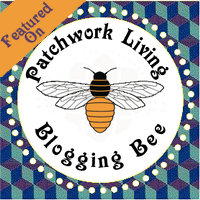 Linked to Patchwork Living Blogging Bee and Make your own! Monday. Well done so super cool! So Cute!! well done, a great idea! A wonderful job on the dolls house. It brings back memories of when we made the box from our frig into Thomas the Tank Engine for our daughter for book week many years ago.